Summertime is the perfect time to explore a beach or ocean theme with children. 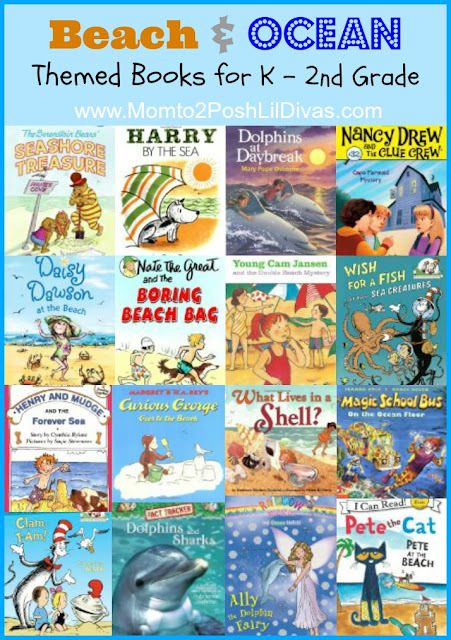 Whether you are spending fun days on the beach, visiting aquariums or enjoying an ocean front vacation you can easily transport your children there with a good book or two or three or sixteen! Below, I have shared some of our favorite beach and ocean themed books for readers in Kindergarten thru 2nd Grade. With a fun mix of fiction and non-fiction, favorite characters and well loved series, and independent and read-together reads - there are books which are sure to please every child on our list. 1. Pete the Cat: Pete at the Beach - If your kids enjoy Pete the Cat they are sure to be fans of these easy readers that are perfect for Kindergarteners. In this book, Pete and his family enjoy a hot day at the beach. Pete is afraid to cool off in the ocean but thankfully his brother is there to help. 2. Young Cam Jansen and the Double Beach Mystery - Young mystery fans will enjoy delving into this easy to read first chapter book with short chapters and simple illustrations as they figure out how Cam lost her mother at the beach after searching for sea shells. 3. What Lives in a Shell? - Kids are always wondering what used to live inside the shells they find at the beach. This book helps answers that question in a way that is perfect for this age group. 4. The Magic School Bus: On the Ocean Floor - Join Ms. Frizzle and her class as they explore the ocean floor. This book is jammed full of great info and the humor you come to expect from the Magic School Bus cast. It is one of my favorites to read with children when exploring an ocean theme. 5. Harry By The Sea - My girls love anything involving dogs so it's without doubt that they enjoy Harry books. He is adorable and always gets caught up in some type of mischief that enthralls young readers. In this book, poor Harry gets covered in sea weed and ends up scaring everyone at the beach. 6. Henry and Mudge: The Forever Sea - This series is great for beginning readers just delving into chapter books. In this book, Henry and Mudge spend a day at the beach and take us through all the activities kids will recall from their own trips to the beach. 7. Rainbow Fairies: The Ocean Fairies Series - If you have a Rainbow Fairies fan at home they will enjoy this series which explores the fairies responsible for popular ocean animals like dolphins, seals, sea turtles, penguins, starfish, whales and clown fish. 8. Nate the Great and the Boring Beach Bag - Oliver, Nate's next door neighbor, lost his beach bag and it's up to Nate to figure out what happened. These mystery readers are great for first graders that are comfortable with chapter books. The chapters are short, there are illustrations and each books has lots of fun extras. 9. Curious George Goes to the Beach - I love Curious George. We have many of the books and this one is perfect for reading with kids during the summer. 10. Nancy Drew and the Clue Crew: Cape Mermaid Mystery - These mysteries are for your advanced first grade to 2nd grade readers. I enjoy them as much as the Oldest Diva because the characters are spunky, intelligent girls who celebrate friendship and are always willing to help others. 12. Magic Tree House #9: Dolphins at Daybreak - The Oldest Diva is working her way through this series. They are great for boys and girls and really appeal to 1st/2nd graders. Dolphins at Daybreak takes Jack and Annie to the ocean, facing an octopus and shark. and be sure to check out the accompanying Magic Tree House Fact Tracker: Dolphins and Sharks. 13. Cat in the Hat: Clam I-Am - There is lots of scientific info packed into this Seuss book making it a great read for K thru 2nd graders that want to know more about the animals found on the beach and sea life. 14. Wish for a Fish: All About Sea Creatures - Fun, rhyming info on lots of sea animals. Kids will enjoy reading this Seuss style book and learning lots of facts along the way. 15. The Berenstain Bears: Seashore Treasure - A fun first reader which takes us on a Berenstain Bear adventure to the beach where they uncover a treasure map. I have some great Ocean themed crafts & activities on the blog. There are lots more ideas on my Ocean, Sea & Beach Fun Pinterest board. Looking for more book lists for your K thru 2nd Grader? Check out our Reading Corner. Disclosure - This post contains Amazon affiliate links.